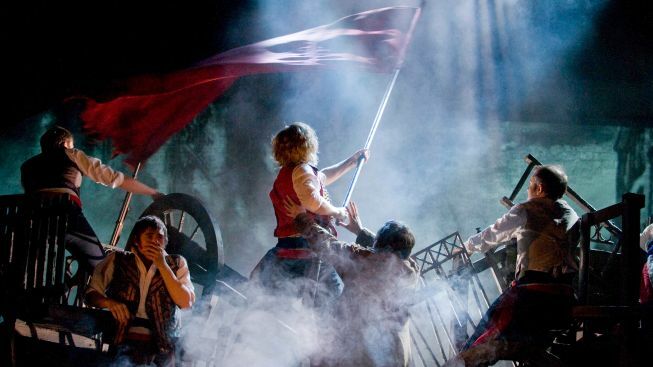 A newly reimagined version of “Les Miserables” will come to Broadway in March 2014, producer Cameron Mackintosh said Tuesday. The announcement comes as the film version of the epic drama prepares to vie for eight Academy Awards, including Best Picture. This latest “Les Miz,” which is sure to capitalize on the film's popularity, will open at a Shubert theater to be decided soon, said Philip J. Smith, chairman of the Shubert Organization. The "Miz" headed here actually first launched in a U.S. national tour in 2010, and features fresh scenic and narrative elements, as well as new orchestrations. The New York Times reports that this latest “Les Miz” sacrifices a familiar design element: the revolving turntable, which was used in both the original Broadway production, which ran from 1987 to 2003, and a revival, which played from 2006 to 2008. The original London production of "Les Miserables" is still running after 27 years. “Les Miserables,” written by Alain Boublil and Claude-Michel Schönberg, is based on the 19th-century novel by Victor Hugo. For more information on the new production, visit lesmis.com.